These gorgeous earrings are made of 18K white gold and include a total diamond weight of 1.48 carats. 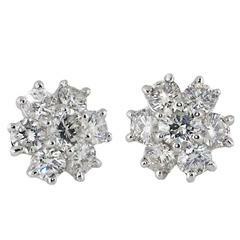 These studs are made up of round diamonds that are SI1 in clarity and G-H in color. These earrings include locking push backs for ultimate security during wear time.